Last week, on May 2nd, the United Nations Security Council issued a resolution threatening both South Sudan’s ruling SPLM and North Sudan’s Bashir government with non-military sanctions if either parties continued to militarily subvert the ongoing negotiations over issues such as citizenship rights, borders, oil and security. This action, coming on top of months of African Union-led attempts to make the official negotiations meaningful through mediation and diplomacy, is a signal of the severity of the threat of a return to full war for two parties that have rarely seen eye to eye, even since the signing of the 2005 Comprehensive Peace Agreement that officially ended hostilities. As the exchange of both gunfire and rhetoric escalates, it is clear to even the most optimistic observer that the separation made official on July 9th 2011 was not a definitive seal on a peace process but one milestone in a journey that may yet stretch for many years. Nonetheless the world’s 193rd country and its people continue to strive to shape and assert their identity in the global arena, not least as a cultural force. 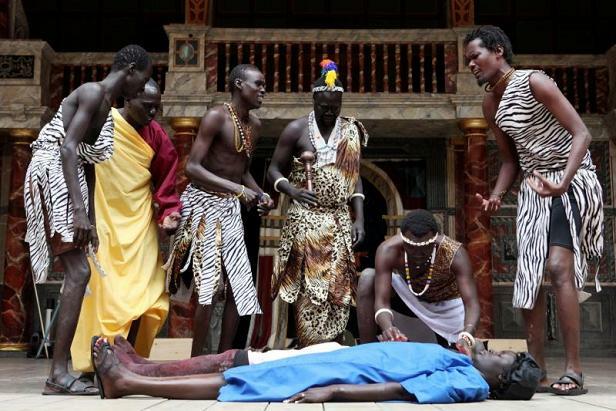 This brings us to the work of the South Sudan Theatre Company, which brought its interpretation of Cymbeline to Shakespeare’s Globe in London earlier this month, on the very day the UNSC Resolution was passed. The co-directors, Joseph Abuk and Derik Uya Alfred, are both veterans of cultural organisations such as the Kwoto Centre and Skylark Dramatists that have, throughout the conflict, given support to South Sudanese artists. They formed SSTC upon independence to celebrate and promote dramatists from the new nation to the world, and have worked with an entirely South Sudanese cast to bring this newly translated script to life in the historic context of the Globe. The performance, part of the ‘Globe to Globe’ season that sees 37 plays performed in as many languages, is delivered in Juba Arabic, a language borne of the interplay between the classical Arabic spoken in the region since the 7th century – which remains the lingua franca of the Sudanese state to the North – and other Central and Eastern African tongues. Between body language and sparing use of digital displays, with short summaries of each scene, sufficient steer was provided to ensure the audience was not left behind. In fact, in the performance’s best moments even this concession seemed superfluous to the enjoyment and infectious energy that the cast wrought from relatively difficult material. Given that the basic plot of Cymbeline involves conflict between a strong willed smaller nation (in this case Britain) and its imperial master (Rome) it might be tempting to infer a straight analogy of the South Sudanese liberation experience from the stage. However, given that the plot also includes poison, cross dressing, several farcical cases of mistaken identity and a king, the eponymous Cymbeline (Arkangelo Mako, displaying impeccable comic timing), who flops his way through proceedings, drawing more laughs than plaudits, and survives as much by accident as design, that temptation is easily tempered. One imagines that even in English there would be a certain amount of misinterpretation on the part of audience and different highlights appealing to different sensibilities; but the subjectivity of any Shakespearean experience was slightly amplified by the additional language barrier. The real core plotline – if one can be found – is the cause of much confusion, heartache and, at times, hilarity, to the protagonists, and involves the romance between Princess Imogen (Margaret Karwato) and Posthumus (Francis Paulino). This is reflective of the fashion in which the play veers between high tragedy and comedy, with little room to readjust from scene to scene as the mood dramatically switches. Nonetheless the quality of the production and performances give shape to a messy plot. There was a certain cognitive dissonance between the venue and the event at first. But the cast made the stage their own. The simple but effective percussive accompaniment gives a sense of urgency to proceedings and the sparing use of props, beyond personal accessories such as the King’s staff, made scenes such as the bedroom theft of Imgoen’s jewelry by Jackimo (Burtus Peter) and the imprisonment and binding of Posthumus by British forces all the more striking in their use of a bed and ropes stretched across the stage respectively. In the latter instance the use of a modern military uniform and whip, a major contrast from the traditional clothes adorning the other characters, gave Posthumus’s guard an added element of malign authority. Another notable scene was the attempted wooing (and rebuttal) of Imogen by Lachimo. In this instance great timing and interplay between the two actors were accentuated by the use of a tiny proportion of the expansive stage to increase tension. The fluid, confident use of space overall was exemplified by the exuberant finale, where the formal end of the play itself and the celebratory dancing of the cast themselves merge in a chaotic, uplifting moment. The two main female actresses, Karwato and Esther Bagirasas (the latter as the domineering, plotting Queen in addition to a memorable piece of moonlighting as the Roman god Jupiter!) deserve special plaudits for their presence and consistent energy throughout. Imogen in particular has a large amount of stage time and Karwato dealt with the demands of the expansive and varied script with evident gusto. Korino Justin, as Imogen’s simpering and well meaning servant Pisanio, shared amusing dialogues with both characters and was also a highlight. Ultimately, however Victor Lado, as Belarius, was the real revelation, bringing grace and gravitas to his role as the wrongly ostracised nobleman who had raised Imogens’ two long-lost brothers to believe in and fight for the King that has rejected him. The significant South Sudanese contingent in the audience were best equipped to pick up on the nuances of the script, as well as the distinctive flourishes that peppered the performance, from the occasional nuggets of English dropped into dialogue to emphasise or mock an Arabic phrase, mirroring the language as actually spoken, to the penchant of some characters for cowboy hats, something familiar to anyone who has seen SPLM politicians in full regalia. Cymbeline himself struts with all of the pomp but little of the dignity or eloquence characteristic of elders across South Sudan. Therein lies the most fascinating aspect of this choice of play, and its delivery. The patriarchal authority figure is exposed as easily duped, manipulated and undermined and yet he survives, retains his sovereignty and, in the somewhat rushed denouement, is able to tie up the numerous loose ends of the plot that reveal themselves to him, dispensing pardons and blessings. There is no mythical epiphany or transcendence and certainly no infallible saviour figure, but there is laughter, life and hope shared by the royals and the commoners alike, there is a fair measure of humility and forgiveness and there is independence, for better or worse. There is absolutely no doubt that SSTC made this material their own and recognition for Joseph Abuk’s translation of the script is richly deserved. Ironically, in working together to portray British and Roman characters, the cast were able to express themselves in a distinctly South Sudanese fashion. Nonetheless I look forward to seeing and hearing more from and by South Sudanese writers and performers, especially giving the incredible depth and diversity of arts and traditions from across the country. Audiences here could very well benefit form that exposure, alongside undoubtedly countless more interpretations and reinterpretations of the classic themes so well covered by the Immortal Bard. Whilst it is very difficult in the final analysis to separate the issue of national pride and identity from the merits of the work in its own right, South Sudanese Theatre now has a world stage for the voices of its people to be heard on. Neither tokenism nor propaganda, this production bodes well for the arts scene of the country as a whole and it is important that initiatives such as SSTC are supported and documented and that the interaction of the international community that South Sudan so recently joined is not reduced to paternalistic directives alone. For more information on SSTC visit www.southsudantheatre.com. To find out about the ‘Globe to Globe’ programme visit its website.